If you have any questions or suggestions you are welcome to join our forum discussion about Stochastic Oscillator. Stochastic Oscillator is a technical momentum indicator that compares a security’s closing price to its price range over a given time period. Its sensitivity to market fluctuations can be decreased by tuning the time period or by taking a moving average of the result. The principle on which the stochastic is based is that during upward trends prices tend to close near their high, while in a downtrend they usually close near their low. As with many other oscillators, the default setting for the Stochastic Oscillator is to track back 14 periods. A 14-period %К would then use the lowest low and the highest high over the last 14 periods, coupled with the most recent close. %D is a 3-period simple moving average of %К and is visualized beside %К to act as a trigger line generating signals. The graph above shows how Stochastic Oscillator looks like. The yellow and light blue lines represent K and D respectively, while red lines define overbought and oversold levels. As mentioned before, the Stochastic Oscillator compares a security’s closing price to its price range over a given time period. Values above 50 indicate that the close is in the upper half of the range and below 50 – the lower half. Low readings, such as below 20, signify that the price is near its low during the tracked period of time, while high readings, such as above 80, mean that the price is near its high during the respective period. Given the Stochastic Oscillator’s nature of a bound oscillator, it is deemed very useful in helping traders identify when an asset is overbought or oversold. It is “bound”, because its values are held within a range of between 0 and 100. Default settings throughout most of the platforms, including MetaTrader4, use the 80 and 20 levels as thresholds for overbought and oversold zones respectively. However, as with most other indicators, these settings are a subject of change and can be fine-tuned to meet each trader’s unique preferences. Readings below 20 for a 14-day Stochastic indicate that the asset was trading near the low end of its 14-day price range. Conversely, readings above 80 are observed when a security is trading at near the top of its high-low range. However, one should not base his/her trading decisions solely on overbought and oversold levels. He/she should keep in mind that overbought levels are not always bearish, just as oversold ones are not always bullish – it largely depends on how strong a trend is. An asset can penetrate the overbought threshold and remain in that area for an extended period of time during a very strong uptrend. Price closing consistently near the top of the range reflects sustained buying pressure. Logically, the same happens on the other side of the range, at the oversold level. One should, therefore, make sure to identify the general trend and trade in its direction, because the price will move for longer in the direction of the trend, while corrections will be shorter. It would then be logical to seek infrequent oversold readings in an upward-trending market and ignore the frequent overbought values. Similarly, one should keep an eye out for infrequent overbought readings during a downtrend and avoid the often seen oversold readings. There are three versions of the Stochastic Oscillator. The Fast Stochastic Oscillator is based on George Lane’s original formulas for %К and %D. Here, however, %К is choppy and %D is a 3-period simple moving average of %К. The Slow Stochastic Oscillator smooths %К with a 3-period SMA, which is what %D is in the Fast Stochastic Oscillator. Take note that %К in the Slow Stochastic Oscillator equals %D in the Fast Stochastic Oscillator. The Full Stochastic Oscillator is a variety of the slow version and it is fully customizable. One can fine-tune the periods tracked back, the number of periods for the %D MA and the number of periods to slow %К. 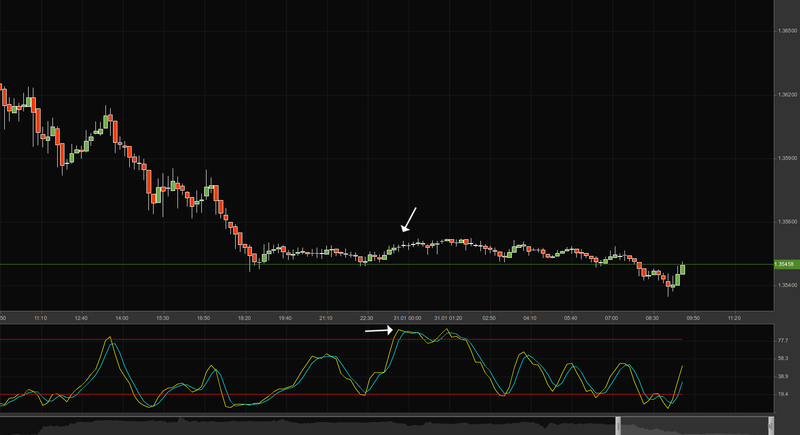 A divergence occurs, if a new high or a new low in price action has not been confirmed by the stochastic oscillator. In case price action records a lower low, while the stochastic records a higher low, we have a situation called “bullish divergence”. This implies that downward momentum is weaker and a bullish reversal might be just around the corner. In case price action records a higher high, while the stochastic records a lower high, we have a situation called “bearish divergence”. This implies that upward momentum is weaker and a bearish reversal might be inbound. After a divergence occurs, technical analysts should look to confirm the signal that a reversal might actually happen. In order to confirm a bearish divergence, analysts should look for a support break on the chart or a stochastic break below the centerline of 50. In order to confirm a bullish divergence, analysts should look for a resistance break on the chart or a stochastic break above the centerline of 50. As the stochastic oscillates between 0 and 100, the central level of 50 is usually closely watched. If the stochastic moves above this central level, this is considered as an indication that price tends to trade in the upper area of its high-low range during the examined period, or implying a situation with a half-filled cup. If the stochastic moves below the central level, this is considered as an indication that price tends to trade in the bottom area of its high-low range during the examined period, or implying a situation with a half-emptied cup. Usually indicators gauging momentum are most appropriately used in flat trends (trading ranges). However, these oscillators can also be used when trading instruments, that do trend, if the trend itself comes in a zigzag manner. Pullbacks represent parts of rising trends, which zigzag up. Bounces represent parts of decreasing trends, which zigzag down. That is why the stochastic can be used in order to detect opportunities in consonance with the larger trend. 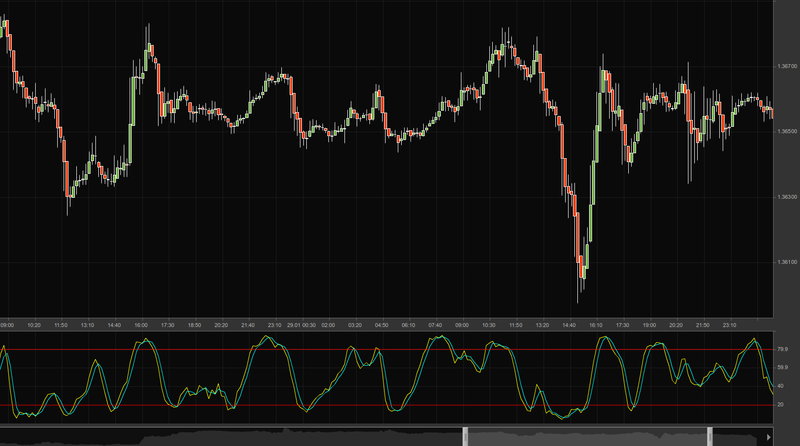 The oscillator is also appropriate to use, if one is to identify reversals in proximity to support (resistance) levels. In case a given instrument trades close to a support level and the oscillator is oversold, one should search for a stochastic break above the level of 20. This may indicate an upward reversal and a successful test of support. In case a given instrument trades close to a resistance level and the oscillator is overbought, one should search for a stochastic break below the level of 80. This may indicate a downward reversal and a failed resistance. The stochastic is usually set in dependence with one’s preferences, style of trading and time frame used. An oscillator with a shorter period will demonstrate a choppy line with a greater number of overbought and oversold situations. An oscillator with a longer period will demonstrate a smoother line with a lesser number of overbought and oversold situations. It is vital for any trader to use the stochastic oscillator in combination with other tools of technical analysis. Like the case with other oscillators, volume, support and resistance or breakouts are to be used in order to confirm or disprove signals provided by the stochastic.